I completed my residency at Acadia National Park! It was a tremendous experience, the impact of which is still affecting my writing. I am eternally grateful to the wonderful people at Acadia for their support and generosity. I’ve climbed TWO 14ers in the Rockies, thankyouverymuch. 14ers are what Coloradans call 14,000+ ft mountains, some of the tallest in the entire country: You’re way above the tree-line at that elevation; oxygen is thinner, and you’re basically hiking uphill and/or climbing over boulders for 5-8 hours straight, then killing your knees for the 2,000-4,000 ft drop on the way down. Hikers and climbers in the region collect them like trading cards: “Hey, I just did Elbert. Have you tried Evans Peak yet?” For the record, the two mountains I summitted are Mt. Bierstadt (14,065 ft) and Quandary Peak (14,265 ft), and I plan to knock out a few more in the coming months. I have a new dog, Maverick, a black lab-mix I rescued from the local shelter. He’s ridiculously smart, kinda stinky, and just wants to be loved up all the time. Also, he snores. I adore him. 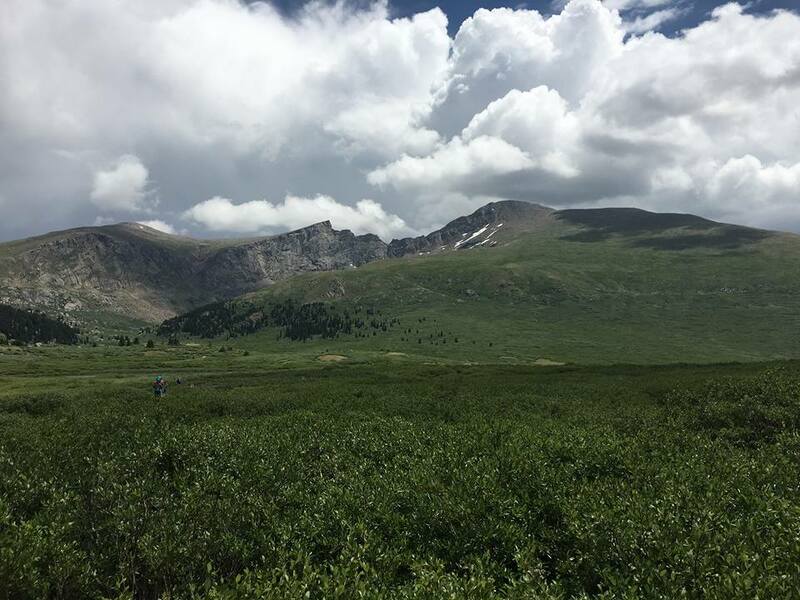 Mt Bierstadt– Yeah, I climbed that. In publishing news, I’m delighted to announce that Artful Dodge, the incredible, internationally-renowned journal out of The College of Wooster, will be publishing my long poem, “Service Flag,” in their next issue, due out this spring/summer! 🙂 Special thanks go out to Daniel Bourne and all the editors for their feedback, support, and selection of my poem. I’ll announce when the issue is available for purchase. Other updates, writing-wise: I AM writing, which is, unto itself, an important update. There have been long periods over the past four years when I wasn’t able to put pen to page or word to Word doc– but in the past year, I’ve taken back my creativity and language and pushed forward. Thanks in large part to my wonderful friend, Amanda Widup, another writer, I’ve started spending significant time each week composing new material, revising, and submitting work. It’s both liberating and terrifying– and feels so good. There are some fantastic organizations for writers and artists here in Wyoming and the Northern Colorado region, including Wyoming Writers, Inc., the Wyoming Arts Council, WyoPoets. and several Facebook groups for local writers (Cheyenne Writes! and Cheyenne Writers Community, to name two). I highly suggest you check them out, especially if you’re living in or passing through the region.